If you love me then set me free…..
Only three and a half hours after the Spring Equinox (Aries ingress) there will be a Full Moon at 00°09’ Libra, a Cardinal, Air sign ruled by Venus. 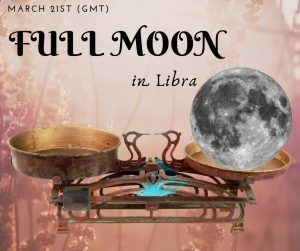 This is the first Full Moon of two in Libra this year (the second one occurs on 19th April on the last degree of the sign). While Aries loves challenges and initiations, fighting for them if necessary, Libra, a Cardinal Air sign, wants partnership and prefers fairness and justice in all relationships, but these are also values that can be fought for too. What do we value most, ourselves or our relationships? And again, are we reflecting our true selves in our relationships or are we making do and letting fear make us possessive and jealous? Venus, the dispositor of the Moon is to be found in Aquarius, a rather detached sign for this sensual planet, Mars the dispositor of the Sun in this lunation is to be found in Taurus, a Venus-ruled sign where the planet is in his detriment. Venus and Mars are in a tight applying square to each other, not wanting to get too involved creates tension with a stubborn, security-oriented Mars. Furthermore, Venus is applying a sextile to Jupiter giving a further boost to freedom loving Aquarius and Mars is separating from a trine to Pluto…power and insistence go a long way. Looks like a good set-up for quarrelling to me! Full Moons are when matters climax, they are “now or never” moments regarding any projects we have initiated or intentions set at the preceding New Moon fourteen days ago or brought to light with the above mentioned eclipses. This lunation takes place on the traditional 7th-1st house axis, Libra-Aries the “you” vs “me”, compromise vs assertion, relationship vs independence etc. Most affected by this Full Moon are those people with planets or angles in the Cardinal signs of Aries, Cancer, Libra and Capricorn. Allow a 2° orb for contacts. according to him, it’s a great time to start creative projects and an even better time to pick up those creative projects you’ve put aside or forgot about or lost inspiration in. It’s also a good time to go public with your art (or your talents I might add). The Sabian symbol for the Moon at 01° Libra: “In a collection of perfect specimens of many biological forms, a butterfly displays the beauty of its wings, its body impaled by a fine dart.” Indicating the immortal archetypal reality that a perfect and dedicated life reveals. For the Sun at 01° Aries: “A women just risen from the sea. A seal is embracing her.” Indicating the emergence of new forms and of the potentiality of consciousness.